Today: When a grilled cheese meets egg in a hole, the sum becomes greater than its components, especially when paired with a simple but surprising cocktail. Back in elementary school, it used to be a (not very good) joke to ask your friends what 1 plus 1 equals. "It's 2," they'd reply. "Wrong," you'd crow, "It's 11." Then you'd laugh and laugh until everyone stopped sharing their dunkaroos with you. But you would have been right, at least in this case. Tonight, 2 very simple things come together to make a unique, comforting dinner -- on a scale of 1 to 2, it's an 11. You're probably familiar with how to make a grilled cheese and how to fry an egg, so the cooking time should take you less than the time it took to complete remedial math worksheets back when that joke was in its prime. Finish off the meal with a refreshing Serpenti, which, despite its simplicity -- its primarily composed of Campari and orange juice -- is transportative. It's the little things that really make this meal: the mayonnaise that crisps the bread up with a deep richness and the demerara sugar that offsets the bitterness of the Campari with a surprisingly sweet crunch. 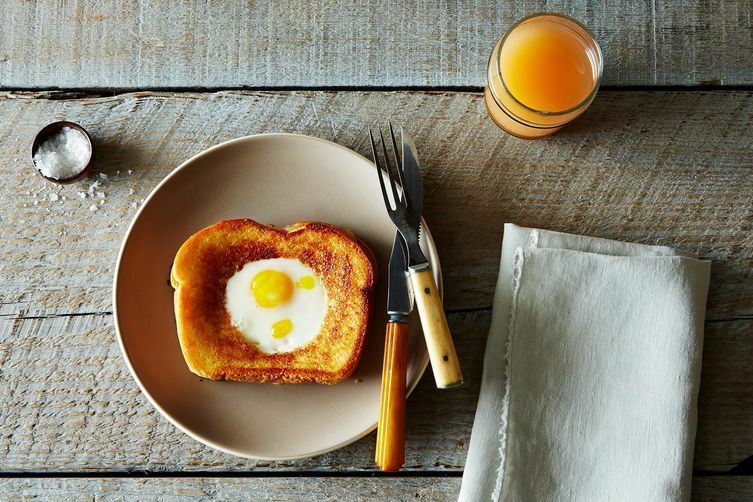 To make the grilled cheese with egg: Heat up a nonstick pan over medium-low heat. Spread a thin layer of mayonnaise on your first slice of soft bread, then place it mayonnaise-side down onto your hot pan. Take one or two slices of your favorite melty cheese. Here's where a little geometry comes in: slice the cheese into thirds, and arrange two slices on two ends of the bread. Cut the last third in half, and arrange on the remaining surface area of the bread, leaving a cheeseless square in the middle. This is the gap where your egg will go. Spread mayonnaise on the other slice of bread, and place it, mayonnaise-side up, on top of the cheese. Cook the sandwich for a few minutes until the bottom is golden brown. Flip the sandwich, and then use a cookie cutter or a drinking glass to cut out a hole in the middle of the sandwich that's 2 1/2- to 2 3/4-inches wide. Remove the circles of bread, although you can and should continue grilling them on the side, in order to dunk them later in the egg yolk. Crack the egg into the hole, cover, and cook until the egg is set to your liking. Slide the sandwich onto a plate, and season with salt and pepper as desired. To make the Serpenti: Fill your tumbler with ice. 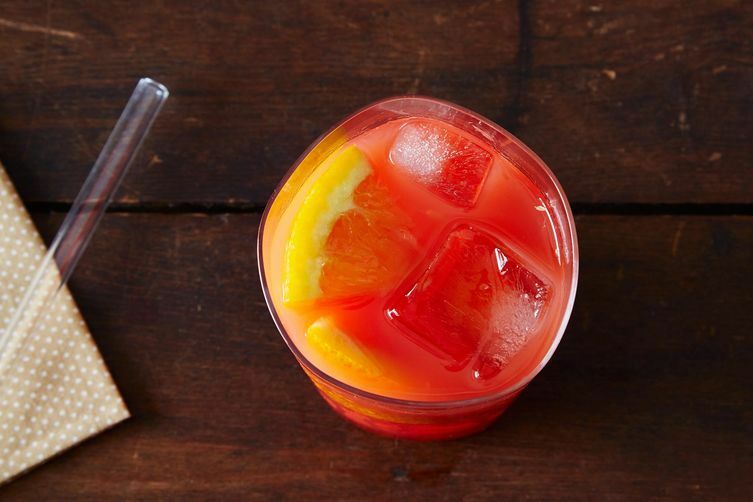 Add 1/4 cup of Campari, 3/4 cup freshly squeezed blood orange or regular orange juice, 2 teaspoons of demerara sugar, and stir well to combine. Throw in 3 slices of orange, stick a straw in, and enjoy! We're assuming you have salt, pepper, and ice. If not, be sure to add those to your list, too. Love this twist! We called them Bullseye eggs growing up, I still do :) Definitely going to try the grilled cheese twist! Pretty sure I could make egg in a hole every day and my husband would be thrilled. Beyond thrilled. And to think, he didn't even like fried eggs when we started dating.